Many people prefer black appliances because they show less dirt and do not stain as easily. 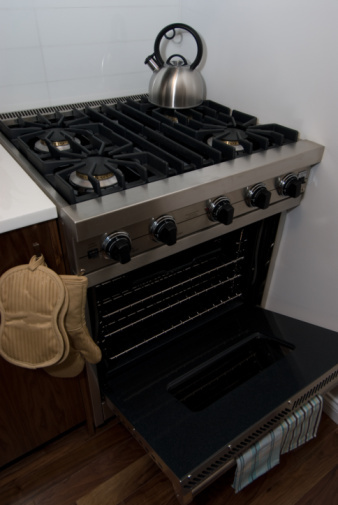 Some gas stoves have removable burner heads, which speed up the cleaning process. Consult the owner's manual to determine if your model has this feature. If an acidic food (such as vinegar or tomatoes) spills on the top of the stove, wipe it immediately with a dry cloth. 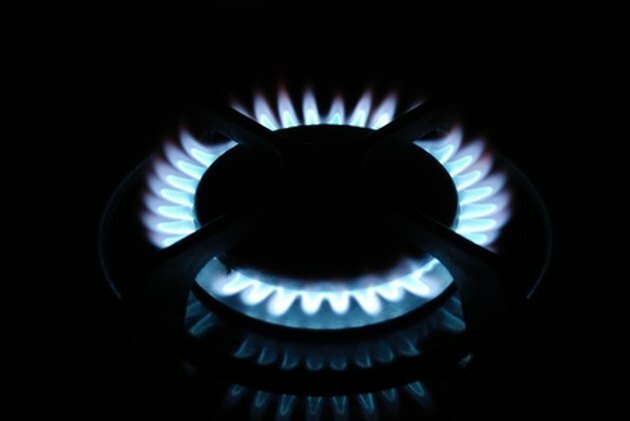 Acid can cause damage to the stove's finish. Clean spills regularly to prevent clogged burners. Clean the stove-top using a cloth and warm, soapy water. Use a nonabrasive, plastic pad to scrub difficult spots. Soak a stubborn spot by covering it with a damp cloth for 30 minutes. Dampen a cloth with clean water and rinse the top. Allow the stove top to air dry. Polish the stove-top with a dry cloth. Pull the control knobs off the stem and wash them with warm, soapy water. Do not soak the knobs or scrub them with an abrasive cleaner. Rinse the knobs and allow them to air dry. Wipe the control area with a damp cloth. Once the knobs have completely dried, replace the knobs. Remove the burner grates and wash them with hot, soapy water. Use a nonabrasive, plastic pad to scrub away soil. To remove burned-on spills, soak the grates overnight in a covered container with 1/4 cup ammonia. Rinse the grates and dry them with a cloth before returning them to the stove. Clean the burners using a nonabrasive, plastic pad and hot, soapy water. Do not wet or snag the igniter. Remove the burner caps and heads by carefully lifting them upward, if your model has removable burner heads. Wash the burner parts with warm, soapy water. Rinse and dry with a cloth. Make sure the burner caps and heads are completely dry before placing them back on the stove. Use a small needle or tooth pick to clean any clogged holes in the burner. Do not attempt to change the size or shape of the holes.